With smartphone prices coming down steadily over last couple of years, one would imagine that the demand is getting higher. However, it seems that is not the case. 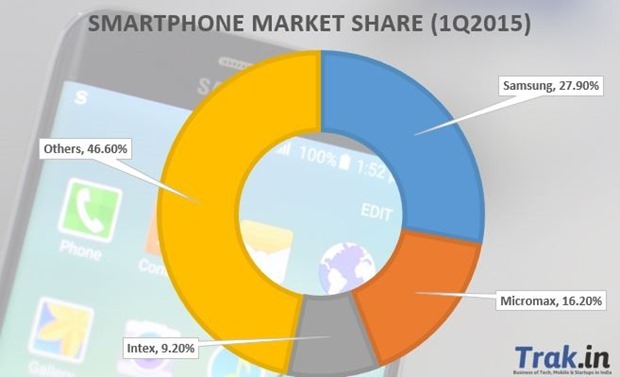 According to CMR’s India Monthly Mobile Handsets Market Review, total mobile handset market in India has fallen by as much as 15 percent compared to previous quarter. While Smartphone market has shown some resilience, it also showed a negative growth of 7 percent quarter on quarter. On expected lines, feature phone sales have fallen quite steeply registering 18 percent fall. 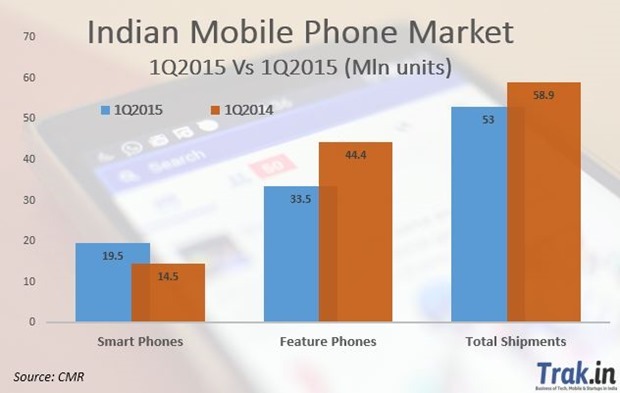 According to the report, a total of 53 million mobile handsets were shipped in in first quarter of calendar Year 2015. Out of these, 19.5 million or about 37 percent of handsets were smartphones, while rest were feature phones. In comparison, 58.9 mln mobile handsets were shipped in first quarter of 2014, out of which 14.5 million were Smartphones and 44.4 million were feature phones. So, when it comes to comparing with same quarter last year, Smartphones have shown good growth. While there have been couple of reports over last twelve months stating that Micromax has dethroned Samsung as number one mobile brand in India, CMR report states that Samsung still has some major lead over Micromax when it comes to Smartphones as well overall mobile handset market share. With 18.5% market share, Samsung still leads Micromax (12.1%) by over 6 percentage points. CMR report puts Microsoft in number 3 position and that is because Nokia is now owned by Microsoft. When it comes to Smartphone market share, Samsung has even bigger lead with 27.9%, while Micromax has 16.2%. If this report is to be believed, Micromax has still a long way to go before they can beat Samsung. It seems, Intex has done brilliantly over pas few months and they are third largest Indian smartphone vendor with 9.2 percent market Share. At the level of individual brands, the CMR report states that Micromax, at second spot, registered a decline to 12.1% in terms overall mobile handset shipments, while in the Smartphones segment its market share was 16.2% as compared to 14% and 17.8% in 4Q 2014, respectively. What is worrisome for Micromax is its widening gap with Samsung, the market leader. While in 4Q 2014, Micromax was just behind by 1.2% compared to Samsung in the overall mobile handsets market and in the Smartphones segment the gap was 5.9%, in 1Q CY 2015, these gaps have increased to 6.4% and 11.7%, respectively. Overall, it seems that Samsung, after a lackluster 2014, is getting back to what it lost in 2014! While Micromax’s Yu Yureka seemed to be very popular, it did not seem to have much effect on their market share.